"A surprisingly fun robot programming game." "Very great for simple, intense, friendly RvR Team PvP"
"A game that is calm in every way... including the story." "This interactive Saturday morning cartoon show will tickle your funny bone"
That’s an amazingly long time in the world wide web. There aren’t many sites that have managed to stay alive for 2 decades! 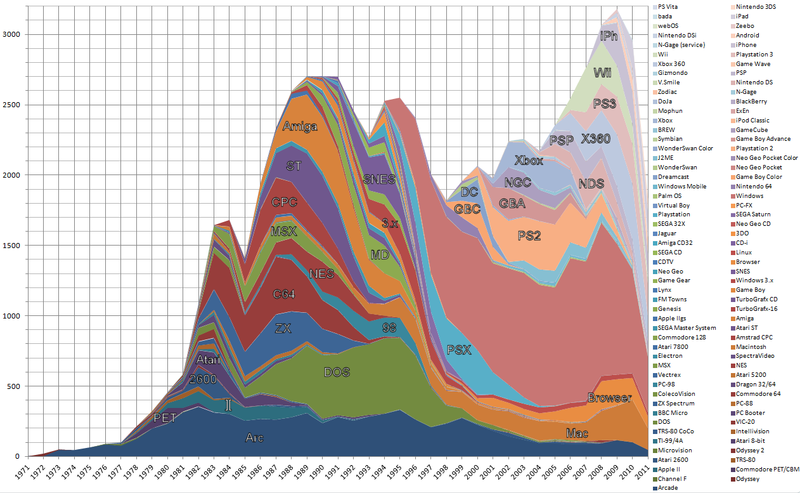 With the help of our wonderful contributors, we have meticulously documented almost 200,000 games from 266 platforms. Including 793,123 developers, 33,015 companies, 850,321 screenshots, 524,875 pieces of cover art and much more! And did you know we now have an API you can access for free? A huge thanks to all of our contributors and approvers! Without their tireless efforts, our database would be quite lonely. Also special thanks to Simon Carless (who helps me - Reed - run the site in-between our day jobs), Brian Hirt for helping with infrastructure emergencies and the intricacies of the codebase, and Tracy who helped with updates and built the API. And of course thanks to Jim Leonard and Brian Hirt who started this amazing project way back in 1999! Check out Jim’s excellent in-depth retrospective. What next?! We’re just beginning! We’ll always be documenting and growing the database. However, the MobyGames platform needs a lot of work and improvements. As you might imagine, things are getting a bit old in the tooth! Combined with the overall complexity of the site it makes for a daunting task, and we’re not currently able to support any staff (ad blockers taken their toll and affiliate sales have dried up). We want to improve the platform and ensure we’re around another 20 years! If you find MobyGames useful and are able to help us with this goal, please consider supporting our Patreon. If even 1% of those reading this contributed, we’d be able to bring on help and make meaningful progress toward improving the platform. Thank you everyone, here’s to another 20 years! Just checking out the overall MobyGames stats page, and looks like we got to 190,000 games (or DLC!) added overall - very impressive indeed. Also a notable stat in there - we're now over 450,000 pieces of promo art, and we're VERY close to 850,000 screenshots, all taken by the community. Good stuff - and I know there's been lots of user milestones too - please post them in the comments! HELP NEEDED: Catch-up on Switch, PS4 releases. Hey everyone - so we're looking for a contributor (or contributors) to help us catch up (using our Entry Helper!) on recent Nintendo Switch and PlayStation 4 releases. Our regular helper on these ended up stepping out later in 2018, so although we're getting the major releases, we're missing a lot of the others. We'd really like to archive digital info from them for posterity - and as you can see on Switch, there's a lot of neat stuff coming out. As per tradition, I present to you the database visualization! Made possible by the MobyGames API. An explanation: each coloured shape in the graph represents a platform. The horizontal axis is time. 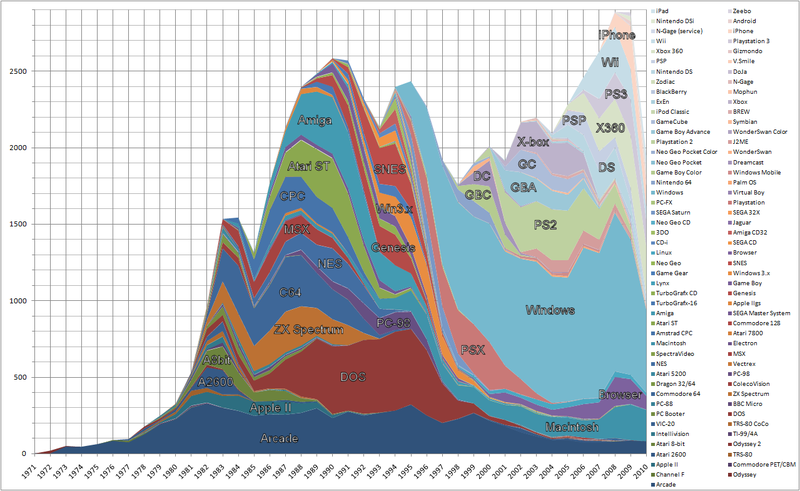 The vertical axis represents the number of games released. 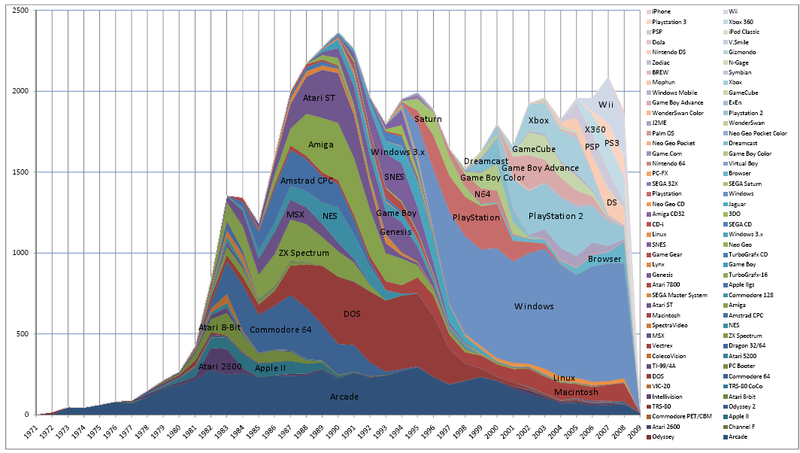 So the height of a shape on a given point in time indicates the number of games released for that platform that year. The total height of the graph on a given point in time shows the total releases that year. The graph is meant to represent new game releases and thus excludes DLC, Special Edition and Compilation items. It does include each game for each platform it was released on. - There are quite a lot of new platforms. In fact there are now so many that Excel refused to render the graph due to a hardcoded limit. I had to switch to LibreOffice to make the graph. - Because I'm now excluding compilations, DLC and Special Edition releases, there are generally less releases per year visible. In particular 2017 ends up with 1000 games less than lass year's graph! My apologies to those who spent lots of time and effort to document DLC, but I just felt it was cluttering the graph! - My pet project this year was documenting games from the late 60s and early 70s. Which shows as a tiny bump in an area of the graph that was previously almost flat. - It looks like we didn't keep up with new releases as well as last year, judging from the drop-off in 2018. - The coverage gap of 2016 has been filled it appears. - Feel free to point out other interesting info in the graph! What was the favorite game you played in 2018? The year is almost over, so it is time to name your favorite games of the year! As it is MobyGames tradition, all games you have played are acceptable, not only 2018 ones. Happy (upcoming!) Holidays from MobyGames! Now the holiday season is approaching, MobyGames would just like to wish all of its contributors a very happy 2018, and a merry 2019, too! New MobyGames DB addition: magazine advertisements! As threatened for a while, contributors are now allowed to upload magazine ads that they've scanned onto MobyGames! We're really excited to build a database around these, since there's nowhere online that you can see them all in one place. Four new MobyGames contributor achievements! - Harmony made it over 20k, an excellent achievement based on many obscure titles. - Cavalary is at the 10k milestone - congrats there, too! PS - Side note - we need some new 'Featured Game' reviews. Add some here, if you have a chance! New contributor thanks: Ms. Tea! MobyGames contributor Ms. Tea has been a member of the site for some time, but has majorly stepped up contributions this year, adding a bunch of interesting & rare titles, so we wanted to thank her! Some notable additions include the very rare Cookie's Bustle, an odd Japanese PC mini-game fest, as well as bizarre Nuon skydiving title Freefall 3050 AD and odd unofficial Genesis game Smart Mouse, among many others. Hurray! More milestones from MobyGames users! Firstly, Patrick Bregger made it over 200,000 MobyPoints, and is currently 3rd all-time - much appreciated! Secondly, Pseudo_Intellectual has been on the site for nearly 15 years & made it over 60k Points in the past few weeks, woot. And thirdly, new contributor Leeona is already over 45k MobyPoints, in less than a year, many of them for Australian cover art we didn't have - SUPER impressive work, y'all. MobyGames - more approvers wanted. Just a quick note - if you are a regular contributor to MobyGames, or would like to help us out after having contributed, we're looking for new approvers! Your job (should you choose to accept it) is to scour the submission queues for info and verify that the user-submitted data is correct before it goes up on our website. We're also looking for existing approvers to expand their scope to new queues/platforms. Either way, please PM me and I can sort you out! Milestones: congrats, GTramp & mars_rulez! - GTramp, who has added all kinds of things but has been particularly strong on screenshots (13,000 so far!) has made it over 60,000 MobyPoints. - mars_rulez, who is invaluable for adding brand new releases for PC and digital console, just made it over 40,000 points. So many thanks to him, too! We need 385 more iPhone games documented to complete this goal! Around two decades ago, a game revolutionized a seemingly new genre in Asia that challenged the leading games of RPGs and strategy games of that day. That game was Harvest Moon (1996). Despite the numerous sequels, one could argue they never seemed to gain the same cult level of fanboi/girl-ism as the original. Not entirely sure why either. For those who may have nostalgic feelings for the original, but perhaps more challenging. Look no further. Stardew Valley is a commendable tribute to the original Harvest Moon. With similar 2D graphics, gameplay may be surprisingly similar with its own unique blend of new features. Farming, fishing, upgrading your house, farming contests, multiple romance options, a semi-fantasy mystery, it's got it all and more. Tired of shooting stuff? Try farming and watch your little babies grow.